1 Instituto de Investigaciones Psicológicas, Universidad Veracruzana. Mexico. 2 Subdirección de Investigación Clínica, Instituto Nacional de Cancerología. Mexico. 3 Instituto Nacional de Enfermedades Respiratorias. Mexico. 4 Departamento de Psiquiatría y Salud Mental, Facultad de Medicina, Universidad Nacional Autónoma de México. Mexico. To explore the views of nurses on death in their practice, and their perception about physicians’ actions dealing with terminally ill patients. Two hundred ninety-five nurses with experience caring for terminally ill patients responded to a questionnaire developed for this study. The majority of participants considered that terminally ill patients should know about their prognosis. Although nearly all nurses said that when a patient brings up the subject and they talk with the patient about death, several of the nurses find it difficult to establish a relationship with these patients. Concerning nurses’ perception about physicians’ actions, they considered that physicians avoid the subject of death with their patients more than the physicians acknowledge. More education and training of physicians and nurses on end-of-life issues is needed to improve communication with dying patients and to provide them with better care. In a recent study that explored the views of Mexican physicians about death in their clinical practices, end-of-life was found to be an important topic for them.9 Though the majority of these physicians valued the need to communicate uncertain outcomes when standard treatments begin to fail, the data obtained appeared to reflect what they thought the correct thing to do was, rather than what they actually did, which remained unknown. Taking this finding into account, nurses comprise a unique source of information to enhance our knowledge of health care during the end-of-life period. The objectives of this study were as follows: a) to explore the views of Mexican nurses about death in their clinical practice, and b) to explore their perceptions regarding physicians’ actions while treating terminally ill patients. We recruited a non-probabilistic sample of nurses who work at one of two high specialty-level public hospitals in Mexico (National Cancer Institute and National Institute of Respiratory Diseases), and care for patients with highly complex medical situations, including cancer and other fatal conditions. Inclusion criteria embodied having completed at least one year of clinical practice in caring for terminally ill patients. Surveys were completed from May to November 2014. 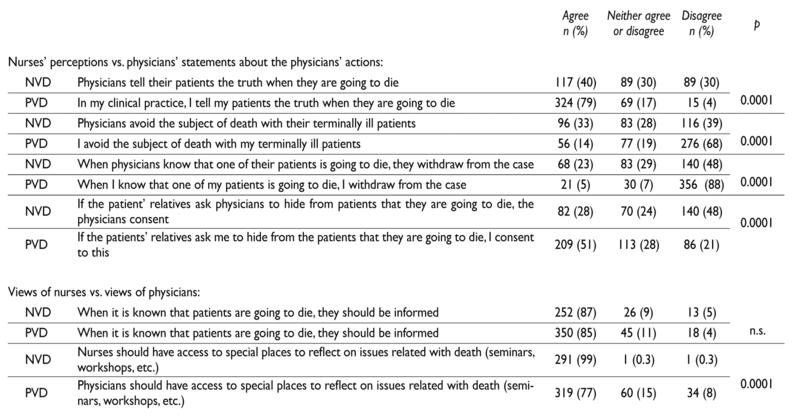 The Nurses’ Views on Death (NVD) questionnaire was developed for this study and was based on the Physicians’ Views on Death (PVD) questionnaire.9 It is an 18-item, 5-point Likert scale whose scores range from 1 (strongly disagree) to 5 (strongly agree) and is divided into two parts: a) twelve items explore the nurses’ views about their practice of caring for terminally ill patients, and b) six items about nurses’ perceptions with respect to physicians’ behaviors in dealing with terminally ill patients, four of these similar to those of the PVD, in that the sole difference is that the wording of the PVD is in the first person and the wording of the NVD is in third person, because it refers to physicians. As in the case of the PVD, NVD content validity was assessed using the Lawshe formula (asking 18 judges), and the discriminative capacity of each item was calculated using the extreme groups method. The instrument was pilot-tested in 15 nurses who had had experience in caring for terminally ill patients. The Research Ethics Review Board of both institutions approved the study where it was conducted, as did that of the School of Medicine of the Universidad Nacional Autónoma de México. The questionnaire was applied from May to November 2014. A researcher visited different places at the hospital and asked nursing personnel if they would be willing to participate in a research project about their relationship with terminal ill patients. Ninety-seven percent of the nurses accepted the invitation, and they were asked to respond to a few questions to determine whether they fulfilled the eligibility criteria for participating in the study. After ascertaining that the criteria were fulfilled, the researcher gave the nurses the questionnaire and asked them to return it no later than the following day. To ensure anonymity, participants were instructed not to insert identifying marks on the questionnaire, and informed consent was deemed as given if the questionnaire was returned duly answered. The time required to complete the questionnaire was calculated at 10-20 minutes. Data distribution was determined utilizing the Kolmogorov-Smirnov and Shapiro-Wilk tests. Frequency of response was analyzed using the chi-squared goodness-of-fit test. Spearman correlations were conducted among the questionnaire’s items. Logistic regression analyses were performed to test the association of explanatory variables and the responses to the questionnaire. These responses were categorized by the median method. Odds Ratios (OR) were calculated as measure of association, along with their 95% Confidence Intervals (CI). Of the 304 nurses invited to participate, 295 agreed (97%). Ages ranged from 20 to 70 years (mean, 38 years) and they had 1 to 45 years of clinical practice. Characteristics of the population are depicted in table I. Frequencies of the responses of participants who disagreed, neither disagreed nor agreed, or who agreed are presented in table II. The majority of participants were of the view that terminally ill patients should be informed that they are going to die (item 1). Moreover, when terminally ill patients have not been informed that they are going to die, the majority of nurses refer them to their physician for being informed (item 5). However, when patients ask nurses about their prognoses, there was a similar percentage of nurses who agreed to tell the patients that they are going to die than nurses who disagreed (item 11). When nurses were asked about their relationship with their terminally ill patients, nearly all agreed that when patients broached the subject of death, the nurses would converse with the patients about it (item 8). Only slightly more than one half of the participants stated that it was not difficult for them to establish a relationship with terminally ill patients and that they do not avoid the subject of death with them; however, the remainder of the participants either reported a difficult relationship with terminally ill patients or were undecided in their answers (ite s 4, 6, 7, 9, and 10). The majority of nurses felt that they were well prepared to care for terminally ill patients, but agreed that they should be offered access to seminars or workshops that reflect on issues related with death (items 18 and 2). Concerning items exploring nurses’ perceptions about the relationship between physicians and their terminally ill patients, there were no significant differences between the number of nurses who claimed that physicians tell their patients the truth when they are going to die and do not avoid the subject of death with them, and nurses who claimed the contrary (items 12 and 14). On the other hand, approximately one half of participants concurred that when the patients’ relatives asked physicians to hide from the patients that they are going to die, the physicians consented, whereas the remainder of nurses either did not perceive that physicians consented, or were undecided with regard to their response (item 13). Finally, nearly one half of participants stated that physicians do not withdraw from terminally ill patients when they know that they are going to die (item 15). The majority of nurses agreed that terminally ill patients talk more with them than with physicians about death (item 16). There were no significant differences between the number of participants who agreed and who disagreed that physicians were used to being prepared to hear the nurses’ views about terminally ill patients (item 17). Correlations between item 1 (“When it is known that patients are going to die, they should be informed”) and the remainder of questionnaire items were calculated. There were significant positive correlations, albeit weak, between agreement with the idea that patients should be informed that they are going to die and the following: 1) the idea that nurses should have access to special places to reflect about death (r=0.22; p<0.0001); 2) the fact that nurses attempt to talk to terminally ill patients about death (r=0.24; p<0.0001), and 3) the fact that nurses notify sick patients about their situation when they have not been informed and ask them about this (r=0.19 p<0.001). Contrariwise, item 1 correlated negatively, also weakly, with the following: 1) the idea that the attending physician is the only staff member responsible for informing terminally ill patients that they will die (r=-0.12; p<0.05); 2) the perception that when the patients’ relatives ask physicians to hide that they are going to die from the patients, the physicians consent (r=-0.13; p<0.03), and 3) the perception that physicians use to be prepared to hear nurses’ views regarding terminally ill patients (r=-0.12; p<0.04). Nurses’ ages and years of professional experience were associated with item 1 only by bivariate analysis. Age presented an OR of 1.046 (95%CI, 1.02-1.07; p=0.026) and nurses’ years of clinical practice presented an OR of 1.05 (95%CI, 1.01-1.07; p=0.024), with both OR interpreted by each year of age or years of clinical practice. No other significant explanatory variables were found either by bivariate or by multivariate analysis (data omitted for parsimony). Table III illustrates the six NVD items that were also utilized in the PVD questionnaire applied to physicians in the previous study (seven). 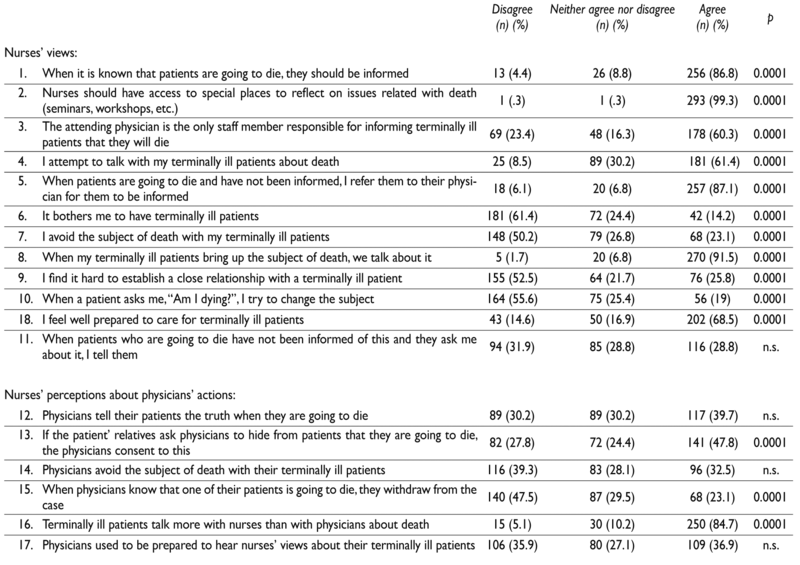 The same table depicts the frequencies of both nurses and physicians who agreed or disagreed with each of these items. 1. 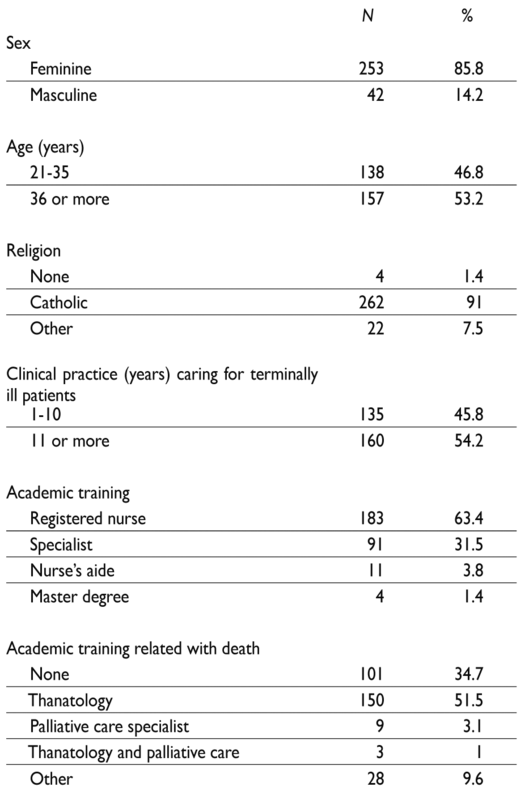 Only six items were compared because they were those that were included in both Nurses’ Views About Death (NVD) and Physicians’ Views About Death (PVD) questionnaires. Concerning the relationship between physicians and their terminally ill patients, fewer nurses than doctors considered that physicians tell their patients the truth when they are going to die. There were more nurses than doctors who considered that physicians avoid the subject of death with their terminally ill patients, or that they withdraw from the case when they know that one of their patients is going to die. In contrast, there were fewer nurses than physicians who claimed that when the patients’ relatives ask doctors to hide that they are going to die from their patients, the physicians consent to this. Finally, there was a similar frequency of nurses and physicians who thought that a patient who is going to die should be informed. There were more nurses than physicians who thought that they (the nurses) should have access to special places to reflect on issues related with death. Of the nurses invited to respond to the questionnaire, only 3% declined to participate. This high response frequency indicates an interest that may be explained by the fact that the subject of death is a concern in the nurses’ daily work. It appears possible that nurses were willing to participate due to the fact that they are frequently not considered to address these matters in their practice. Our results demonstrate the importance of more education and training of physicians and nurses on end-of-life issues. In fact, it has been demonstrated that education has positive effects on communication with dying patients, providing better care for them.18 This training must be integrated by practical experiences that complement theoretical information, enhancing coping skills for professionals who deal with the end-of-life of their patients. Another recommendation deriving from this study is to define the clinical processes involved, considering improvements in the multidisciplinary team approach.21 In recent years there has been an increase in awareness of the importance of improving communication skills between physicians and patients with severe diseases, enabling them to discuss the concerns and desires that arise at the approach of death, avoiding unjustified aggressive treatments and focusing on a better quality of life.2 This is expected to extend to other members of the health care team, such as nurses. There are some limitations to this study and some suggestions should be taken into consideration. First, study participants were comprised of nurses working only at two institutions in Mexico, which makes it difficult to generalize the results. However, these institutions concentrate nurses with the highest levels of specialty, those who predominantly care for terminally ill patients on a daily basis. Second, we cannot be sure whether participants responded according to what they really do or what they claim to do. Finally, further research should include interviews or focus groups to explore the issue in depth, as well as other variables, such as the emotional impact on nurses caring for terminally ill patients, burnout syndrome, and nurses’ communication skills. The authors thank Maggie Brunner, M.A., for her English-language editorial review, as well as Doris Darlene Carmona, Fabiola Orihuela, Kristian Jasso, Jannella Mora and María del Pilar Ayala-Gonzalez for their support in applying the surveys to nurses and in providing data management.